One of the cookbooks I received from Chris for Christmas was Family Celebrations with the Cake Boss. Today I was looking through it and came upon tonight's recipe. 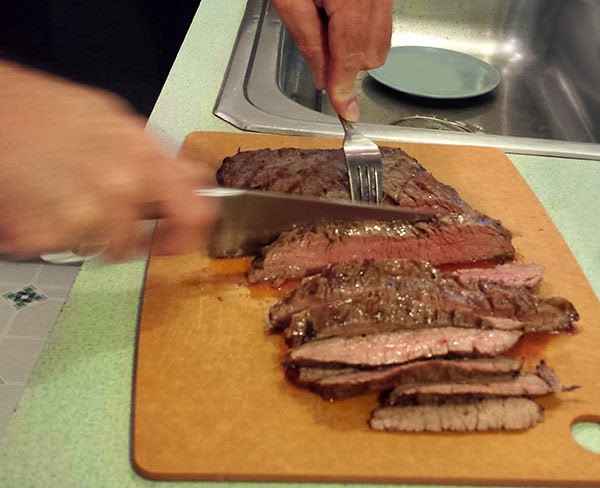 I had picked up a Flank Steak yesterday at Robert's using the 20% off your entire meat purchase coupon. This is the a coupon that comes out 3 or 4 times a year. And this is when I stock up the freezer. I did not go overboard, but I brought home some good buys. Anyway, back to dinner. Chris out did himself on the grill tonight. He is the Grill King. This steak was spot on. For the Salsa Verde I used parsley, sage and thyme for the plants on the deck. I omitted the garlic and the anchovies. I love just about anything with fresh parsley. I could have eaten just the Salsa Verde with the grilled bread. 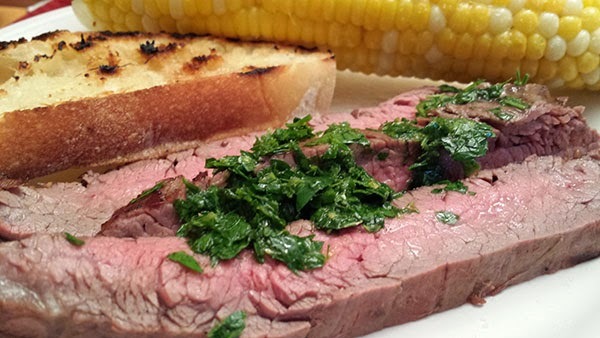 From Family Celebrations with the Cake Boss Flank Steak with Italian Salsa Verde. Season the steak with salt and pepper and let sit at room temperature30 minutes before grilling. Meanwhile, preheat the grill to medium-high heat. Grill the steak over direct heat, turning once, 6 to 8 minutes per side for medium-rare, a bit longer for more well done. Remove and transfer to a platter or cutting; tent loosely with aluminum foil and let rest 5 to 10 minutes. Meanwhile, make the Salsa Verde: Put the parsley, oregano, garlic, lemon juice and zest, olive oil and anchovies (if using) in a food processor. Pulse until well-chopped, about 30 seconds. 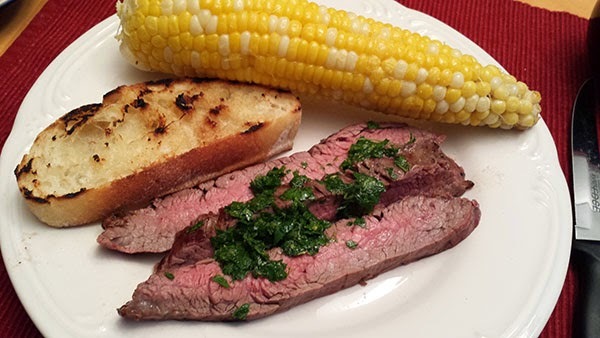 Slice the flank steak thinly against the grain, arrange on plates or a platter, and dollop with the Salsa Verde.